What are the Names of Santa’s Eight Reindeer and Why is Donder called Donner in Chrismas Songs? However, in the popular song “Rudolph the Red-Nosed Reindeer,” the reindeer is called Donner. Donner means “thunder” in German, so it’s not such a terrible gaffe. The names of the eight reindeer used in Clement Moore’s Christmas poem are called Dasher and Dancer, Prancer and Vixen, Comet and Cupid, and Dunder and Blixem. The popularity of the Christmas song “Rudolph the Red-Nosed Reindeer” added Rudolph to the roll-call, increasing the reindeer’s popularity as Christmas symbols. How did Reindeer get their Name, Where do They Live, and What do Reindeer Eat? 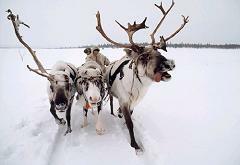 How Many Wild Reindeer are Left in the World and How many Reindeer have been Domesticated? Where Did the Santa Fe Trail Begin and End and Did the Santa Fe Trail Begin In St. Louis?